Michael Weatherly as Anthony DiNozzo Jr in a screencap from the NCIS Season 2 premiere episode, "See No Evil". Anthony D. "Tony" DiNozzo, Jr. /dɪˈnoʊzoʊ/ is a fictional character in the CBS TV series NCIS portrayed by American actor Michael Weatherly. An original character created by producer Donald P. Bellisario, he is credited in 306 episodes of the series, appearing in 305. He has also made guest appearances on the spin-offs NCIS: Los Angeles and NCIS: New Orleans. The character is scripted as the senior field agent of the fictional Major Case Response Team (MCRT) led by Gibbs. A former police detective, he is athletic and charismatic—at least, when not being snarky/smarmy. He describes himself as a former jock, and often leads crime scene investigations; when not at work he is a movie buff. Over the course of the show, he carries a few storylines, namely an undercover assignment that carries through Season 4 and into Season 5. Throughout the show, he is renowned for providing comic relief for an otherwise serious drama show, regularly spouting movie trivia, especially in the early seasons, and being a womanizer who fears commitment. The death of Sasha Alexander's character, Ex-Secret Service Agent turned NCIS agent Caitlin Todd, in the second-season finale and his relationship with Cote de Pablo's character, Mossad officer turned NCIS agent Ziva David, who is introduced in the third season, becomes fundamental to his subtle shift in attitude. The character drew mixed reactions from the audience. According to Bellisario, Tony was often criticized by the female audience at the beginning of the show's run for his chauvinism. This softened after Weatherly decided to tone down that aspect of his portrayal, and afterwards the character was better received. Critics continued to be both amused and annoyed by his "charming goofball" persona, and his "will they/won't they" relationship with Ziva later became popular among viewers. By 2011, Weatherly was listed among the top 10 most popular actors on primetime television, according to Q Score. In January 2016, Weatherly and CBS confirmed Season 13 would be DiNozzo's last as a series regular. In the show, DiNozzo leaves after finding out he has a daughter with his former partner and Special Agent, Ziva David, who apparently died in a mortar attack on her home in Israel. DiNozzo leaves NCIS in order to "look for some answers" and to care for their daughter. 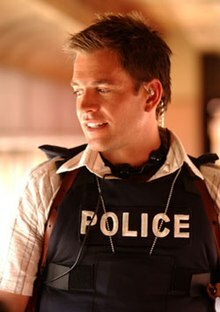 Michael Weatherly was cast for the role of Tony DiNozzo Jr. in 2003. Series creator Don Bellisario related the events that led to Weatherly being selected: "I liked him from the first moment I met him. I first met him in Australia, where he was doing the Natalie Wood story, and he was playing RJ. And the agents called me, or the casting director called me, and said, 'I would like you to meet Michael Weatherly.' And I was on my last day down there, and I said, 'Yeah, I'm going home tomorrow. You know, I'll meet him when he comes back to the States. I'm going out to dinner with my family tonight. I just don't have the time.' I received a phone call from Michael, and Michael knows how to flatter you. He started off by saying, "Oh, I love Magnum, P.I....' And then he started telling me all the things he knew about Magnum, P.I. And I said, 'Look, if you want to go to dinner with me and my wife and two of my boys, you're welcome.' Well, that ended up to be a three hour dinner. It might have gone longer. I liked him so much that I cast him in the show after that meeting." On another occasion, Bellisario stated, "I can't say enough about Michael Weatherly...He started out on NCIS [playing] a character who was just very unlikable to some women because he was just such a chauvinist, and he has gradually over the [seasons] changed. Taken his character and softened it." Weatherly said that he had initially been reluctant to join a JAG spin-off and explained, "But I went and had this dinner with Don Bellisario in Australia and his personality, his storytelling and his presence and everything kind of won me over." He later commented, "I got very lucky with Don Bellisario. He directed two of the first three episodes, and he really pushed me to try things and experiment and some of the wacky comedy came out of that. And it was kind of unexpected and I didn't really know what I was going to find." At another point, Weatherly said, "It's kind of fun to play a total dinosaur in terms of sexual politics...The shallow end of the philosophical pool is obviously where Tony paddles around." In the same interview, actress Cote de Pablo (who portrays character Ziva David) added, "There's something deeper about that character. We always talk about the superficial element and the things that make us laugh. But he wouldn't be doing what he does if he wasn't really good at it. It's a complex character, and that's why people love it." Weatherly has since directed the 2011 episode "One Last Score" and the 2013 episode "Seek". Tony is scripted as coming from a wealthy Italian American family from Long Island, New York. His great-grandparents immigrated from Italy to Ellis Island. His great-grandfather drove a truck for $2 a day until he was able to start his own transportation company. His grandfather introduced Swiss Army knives in the US. He is an only child, but has been cut off from his maternal family's fortune. His mother, maiden name Paddington, died when he was eight years old. According to Tony, she died in the hospital while they were watching a movie. She went through a "Louis XV phase" when Tony was five that inspired the decor of his childhood bedroom and gave him vampire nightmares. She also drank Tony's Sea Monkeys, confusing their sea castles with her mint julep. One of Tony's fondest childhood memories during the holidays is watching the movie "It's A Wonderful Life", and he later tells Ziva that his mother had taken him to the movies frequently before her death, resulting in his love of film. Tony's father, Anthony DiNozzo Sr. played by Robert Wagner, is an American Civil War reenactor and as a child, Tony would carry the "poop bucket" during reenactments. This has resulted in a dislike of anything relating to the Civil War. It has also been suggested that his father was emotionally neglectful, and indeed that Sr. skirts very close to the line between a businessman and a con man, and at one point Tony was left in a hotel room for two days when his father left for a supposed business meeting. In "Flesh and Blood", Tony's father is in DC and the two share similar personality traits—they both flirt with women and quote movies. It is stated in "Flesh and Blood" that his father is pretending to be rich when he is actually bankrupt. It is also revealed that after his mother's death, Tony and his father spent very little time together and rarely kept in touch. Tony also spent much of his childhood in a number of boarding schools and summer camps. As a result, father and son had a frosty relationship. Aside from the odd comment or casual reference, Tony rarely mentioned his parents until Season 7, when DiNozzo Senior makes his first appearance. In "Sins of the Father", he admits to Gibbs that, although his dad still "makes [him] crazy", he still loves him but has been unable to tell his dad so. In "Broken Arrow", DiNozzo Sr. helps Gibbs with a case by using his contacts and going undercover with Ziva at a hotel party. Tony and his father also reconcile their differences. Other family members mentioned in NCIS episodes include a button-collecting grandfather who bequeathed Tony one thousand shares in a dot-com, and a number of uncles. His uncle Vincenzo is a butcher on Long Island. A second uncle was a successful businessman, but was found at a golf course looking for mole people. A third uncle named Clive Paddington, wealthy and deceased, left his entire estate to his paternal nephew Crispian Paddington. On his mother's side he is a direct descendant of Archibald Drummond, 17th Earl of Trent, who was a scoundrel, thief and con artist, who died at Newgate and who might have been Jack the Ripper. He is 89% European, 8% North American, 2.9% Neanderthal and 0.1% African. After being expelled from six boarding schools in four years, Tony managed to graduate from the Remington Military Academy in Tiverton, Rhode Island, and graduated from The Ohio State University with a Bachelor of Arts degree in physical education. During his time at Ohio State, he was on the varsity basketball team and made it to the Final Four before losing to UCLA. He also discusses a football game in the episode "SWAK", between his team (Ohio State) and his doctor Brad Pitt's (no relation to the actor of the same name) team (Michigan). He mentions having broken his leg during this game or more accurately, Pitt breaking it for him. In the episodes "Bikini Wax" and "Trojan Horse", he mentions he is in the Ohio State Alpha Chi Delta fraternity, class of 1989. At the end of the episode "Red Cell", he begins to tell a story about his fraternity days before being interrupted by Gibbs. In the episode "Child's Play", he mentions receiving a combined score of 950 on his SATs. He has worked in three different police departments—Peoria, Philadelphia, and Baltimore—staying in each location for an average of two years. At the end of his stint with Baltimore's homicide division (sometime in 2002 or 2003), he was hired by NCIS. This event occurred prior to the NCIS pilot and the circumstances of his hiring are largely unknown, but Tony once jokingly claimed that it was because he "smiled". It is later revealed in the Season 8 episode "Baltimore" that Tony left Baltimore PD after discovering that his partner, Danny Price (Scott Grimes), was a dirty cop. During his tenure as a NCIS special agent, Tony has operated as a supervisory special agent and undertaken a long-term undercover operation throughout season four. In season two, he nearly dies from a bout with the pneumonic plague (lung infection by the same bacteria as bubonic plague, nearly always fatal) after a woman sends a letter filled with genetically altered Yersinia pestis to NCIS for revenge for what she believed to be neglect of a cold case. However, he recovers. At the end of season five, Tony is assigned as Special Agent Afloat to the USS Ronald Reagan and later to the USS Seahawk. However, at the beginning of season six, he is reassigned to his original team back at NCIS headquarters in Washington, D.C., as Director Vance allowed him to come back from the Seahawk. When Gibbs retires to Mexico after being blown up and sent into a coma in season 3, Tony leads the team skillfully in Gibbs' absence. After Gibbs comes out of retirement, he returns to his previous position. Director Shepard offers Tony a team of his own, but he declines because Gibbs was experiencing some after-effects from his coma and also out of reluctance to leave the team he was already with. During season 8 he meets E.J. Barrett, who took the post as team leader in Spain that he had previously rejected. In the season 8 finale, Clayton Jarvis, the new Secretary of the Navy, tells Director Vance that he wants to include DiNozzo in NCIS's black operations program after the death of Lt. Jonas Cobb and the resignation of Jarvis's predecessor, Philip Davenport. Although Vance seems reluctant, Jarvis overrules him and gives DiNozzo his first assignment: stop an NCIS agent who is leaking information. In the season 9 debut episode, "Nature of the Beast", it is revealed that NCIS Special Agent Simon Cade is the apparent mole. At the end of the episode, DiNozzo is left injured after being shot in the shoulder by an FBI agent who is actually an impostor and who had also killed Cade while attempting to frame DiNozzo for the murder. He frequently refers to himself as "Very Special Agent Anthony DiNozzo". He has also referred to Ziva David as "Very Special Probationary Agent" at least once. Tony also referred to Timothy McGee as "Very Special Agent Timothy McGee" after resigning from his position as Senior Field Agent. Tony is written as a streetwise, promiscuous former homicide detective. His behavior toward women is occasionally noted by other characters to be chauvinistic, and throughout most of the series Tony is shown flirting with nearly every woman he encounters. He does not respect personal boundaries, going so far as to rifle through his colleagues' possessions, both at work and in their homes, and listen in on private phone calls. In the episode "SWAK", Caitlin Todd described him as an "X-rated Peter Pan" who is "annoying" but whose absence is nevertheless keenly felt. The targets of this behavior are either victims of Tony's quests for new sources of amusement, or those for whom he believes he has reason to be concerned. Michael Weatherly commented on Tony's characterization: "Part of the dynamic of the show is that Tony irritates people, but when he's not around, they kind of miss him." Although Tony is canonically in his thirties, he is typically written as possessing a juvenile sense of humor that manifests itself in name-calling, teasing, and pranks directed at his colleagues. Tony delights in quoting movies in everyday life, often mimicking the original actor when quoting them; Sean Connery's James Bond and Tommy Lee Jones come up frequently. Tony also finds parallels between the cinema and his everyday life. This occasionally proves to be more useful than aggravating, as when his application of a solution from the movie Speed (1994) ends in the successful resolution of a case. In a nod to NCIS creator Donald P. Bellisario, Tony has also been established as a fan of the television series Magnum, P.I. and Airwolf, both of which are also Bellisario productions. In the episode "Dead Man Talking", Tony introduces himself to a suspect as Airwolf character "Stringfellow". Tony's coworkers often display visible frustration with his behavior, but throughout the series Tony has been shown to be very loyal to his coworkers at NCIS, particularly his supervisor, Leroy Jethro Gibbs. Although his immature behavior often gets Tony into trouble, he also demonstrates that he is an insightful agent when the need arises. On more than one occasion he surprises his colleagues when an outwardly immature action on his part actually causes new evidence to be uncovered. Gibbs once said of him, "You may not admire his methods but you gotta love the results" when Tony goes to a gynecologist to track a missing sailor's girlfriend down after the rest of the team hit a dead end, much to Kate's disgust. McGee has described Tony's interrogation style as "Dirty Harry meets Keystone Cop" in Season 6. He is generally written as a highly capable agent, and in season four is offered a prized position as a supervisory/senior special agent in charge in Rota, Spain, which he nonetheless turns down. As of Season 10, he is the only one out of Gibbs' field team who has been allowed to head an investigation, as seen in "Bounce" when Gibbs swaps places with him as the victim was connected with one of Tony's old cases and even calls him "boss". Tony is known to be fluent in Spanish, as is established from his earliest appearance in the JAG-NCIS crossover episodes as well as throughout the NCIS series. As Gibbs' most senior field agent, he often pulls rank by ordering the more junior agents around and playing pranks on them. He most notably called McGee "Probie", at least until Ziva was made a full-fledged agent. With the addition Ellie Bishop, Tony and McGee begin calling her "Probie" and similarly order her around, claiming that "it's part of the job". Tony claims to have 20/10 vision in the episode "Left for Dead"; however, in the episodes "The Curse", "Ice Queen", and "Meltdown" he can be seen wearing glasses and in the "Nature of the Beast" episode he claims his vision is 20/20. He also once donated to a sperm bank, but no one wanted to use his sperm. He owned a 1990 Corvette ZR1, which was stolen and subsequently destroyed during a high-speed chase as he watched on live television. Later, he drove a 1966 Ford Mustang. The car was destroyed by a bomb planted on it in an attempt to kill DiNozzo's significant other, Dr.Jeanne Benoit. DiNozzo has also had a close call with the pneumonic plague (commonly called bubonic plague) (Yersinia pestis infection), and he sustained slight lung damage because of the infection. The character is initially portrayed as a "technophobe" who, like his superior, has limited patience with the scientific method and technical terms. However, he can be seen to develop an aptitude for technology in later episodes, and has been depicted hacking into computer systems. Tony is also very skilled in going undercover, which is shown in "Split Decision" (where he poses as a rogue weapons-dealer, unknowingly uncovering a Bureau of Alcohol, Tobacco, Firearms and Explosives operation in the process) and "Chained", where, while disguised as a prisoner, he befriends an escaped convict named Jeffrey White who has information on stolen Iraqi antiquities. In "Dead Man Talking", he is able to improvise a cover identity to get close to a suspect when he feels the investigation is going nowhere. During the entire run of NCIS, Tony consistently speaks at great length about women. He pursues women on a regular basis, typically indiscriminately, though he has shown an aversion to women who don't shave. Most of these relationships fail to progress past a certain point and have occasionally ended with humorously disastrous results. He has admitted to having commitment issues. One of the women he was attracted to turned out to be a terrorist working with Ari Haswari; another to whom he was attracted, and kissed, turned out to be a pre-operative transsexual who had murdered one of Tony's co-workers. His co-worker Caitlin Todd gave him endless grief for that lapse of judgement in the episode "Dead Man Talking". He once dated a social worker named Michelle, who, after he ended their relationship, broke into his apartment and filled his closet with dog feces. He also had a short relationship with NCIS Special Agent Paula Cassidy. He also broke up with a Navy lieutenant (who had left her then-fiancé for him), and shortly after Tony broke up with her, she posted his name, identity, and information on a herpes alert website. The NCIS writers make reference to one of Michael Weatherly's real life relationships in the episode "Hiatus (Part 1)" when he states, "I've got a better chance of hooking up with Jessica Alba...". Weatherly's real life relationship with Alba occurred during his tenure on the television series Dark Angel. In a flashback in the episode "Baltimore" Tony mentions proposing to his long term girlfriend Wendy, also his high school music teacher, but he never got married. Wendy is introduced in the season nine episode "Secrets". Tony has a friendly relationship with Abby Sciuto. Abby describes this as progressive: "You're like a piercing, Tony. Takes a while for the throbbing to stop and the skin to grow back". The strength of their friendship has been demonstrated in such cases as when she goes to great lengths to clear his name after her assistant framed him for murder, when he is seemingly killed in an explosion, and when he returns from his time as an agent afloat. Abby, at one point, vocalizes, "I love you, and would hate to see you hurt". She has become upset with him in some cases, such as when her cupcake is stolen and when NCIS director Jenny Shepard is killed (Tony and Ziva had been assigned to protect her), but these feelings are often resolved quickly and she is back to her normal behavior. Abby is as big a movie fan as Tony, and that also solidifies their friendship. When Gibbs was injured in the Season 3 finale and retired during the first few episodes of Season 4, Tony was usually the one to bring her Caf-Pow. He is also protective of her, especially after Ari Haswari made an attempt on her life in "Kill Ari". While Abby was in a coma, Tony was shown to be very worried about her, to the point he did not make a joke about McGee's last name. Throughout seasons 4-10 Agents Ziva David and Tony Dinozzo were known to exhibit a high level of chemistry. Fans of the show often rooted for the pair to end up together. Their chemistry hit an all time high in seasons 6-7 following Agent David's encapturement in Somalia followed by a mission led by Tony Dinozzo in order to save her or, admitted by Dinozzo, die for her. Although their relationship was not explicit until the last couple episodes of either characters' appearances on the show, the two had a close relationship which resulted in their daughter, Tali. In Season 4, Tony's new girlfriend, Dr. Jeanne Benoit, is introduced and appears as a recurring figure and subplot throughout the season. Tony and Jeanne do not at first consummate their relationship, because Tony reveals that he wants to "take it slow" out of fear of this relationship becoming like his earlier ones. When questioned by Jeanne, Tony's explanation revolves about his previous misogyny and that a repeat performance would ensue if they followed the same route. Tony and Jeanne subsequently consummate their relationship in the episode "Smoked". Tony is determined to have a positive outcome for this relationship and goes to great lengths, though often with a lot of inspiration from films, to make their relationship special. Despite his earlier good intentions for the relationship with Jeanne, Tony cannot bring himself to tell her that he loves her, which causes trouble between them. In the episode "Grace Period", Tony is told by his earlier love interest, Paula Cassidy, who has just lost two of her agents and blames herself for their deaths, that if he loves someone, he should tell her while he still can. Tony is left distraught following the death of Cassidy during a suicide bomb attack on Gibbs' team. He later goes to see Jeanne and, following Cassidy's advice, tells her he loves her. The last scene shows Tony embracing Jeanne while crying on her shoulder with R.E.M. 's Everybody Hurts playing in the background. Tony demonstrates his commitment to the relationship when he confronts Jeanne about her previous boyfriend. Tony's suspicions become aroused by the constant contact between Jeanne and her former boyfriend in the form of calls and emails. Tony coincidentally meets Jeanne's former partner, who is in fact a Metro police officer named John, though neither of them are aware of the other's relationship with Jeanne. They bond through the fact that they are very similar in character, sharing many habits and traits. Unbeknownst to either Tony or Jeanne, John says goodbye to Jeanne in an email and dies in Tony's arms. In the episode "Angel of Death", it is revealed that Jeanne's father René is La Grenouille ("The Frog"), a French arms dealer that NCIS Director Jenny Shepard has been obsessively trying to capture for ten years. However, in the episode "Bury Your Dead", it is revealed that Tony is using Jeanne, as part of an NCIS assignment (with a tie in to the CIA's Operation LODESTONE), to infiltrate an arms smuggling network. Jeanne leaves Tony a greeting card in her apartment, as she leaves the Washington, D.C. area. In the episode "Family", Tony is shown struggling with how his relationship with Jeanne ended and throughout the episode has flashbacks of the relationship. Ziva tries to console Tony, but he rejects her attempts insisting that he is fine. At the end of this episode, the message in Jeanne's card for Tony is visible; "I'm not coming back. You need to choose." After looking at a family reunited with their newborn baby, Tony tosses the card into the fire and rejoins the team. Jeanne makes a reappearance in the episode "Internal Affairs", when she accuses Tony of murdering her father. At the end of the episode, even though Tony is initially angry with Jeanne for accusing him, Ziva advises him to "be a man" and tell her what she needs to hear. Tony speaks to Jeanne, apologizing for letting her get involved in something that was not her fault. Jeanne responds by asking Tony if their relationship was real and, after a pause, he answers "No". Jeanne then tells him she wishes she had never met him. In a conversation with Tara Kole, Tony admits that, since his relationship with Jeanne ended, he has not been enjoying his normal level of success with women, despite his continued bravado to his co-workers. Jeanne returns in the episode "Saviors" when NCIS investigate an attack on volunteer doctors in South Sudan. Two doctors go missing, one of whom is Jeanne's husband. She joins Tony and McGee on their mission, where Tony promises that they won't rest until they locate her husband. On their return flight, Jeanne thanks Tony and tells him that she owes him. He responds "No, you don't... we're good," leaving the pair to part amicably after eight years. Months later, in "Loose Cannons" Tony encounters Jeanne and her husband while investigating a case, where she worries about it being connected with her father, which Tony assures her it isn't. However, when NCIS finds out that the case is connected with her father, Jeanne accuses Tony of lying to her. He tries to apologize, as he didn't know, but she says she was beginning to feel whole again until encountering him. Later, after the case is closed, Tony returns to Jeanne's office to find her alone after a fight with her husband regarding her unresolved feelings for Tony. Tony fully apologizes to her and sits down with her, admitting he isn't feeling whole either, and they have an amicable conversation about both of them wanting to go back in time to fix their relationship in hope of a happier ending. However, as they part, they both stand up and have a tense moment where they nearly kiss, but both agree it should not go any further. Tony's ex-fiancée is mentioned briefly in the episode "Baltimore" as Wendy Miller, portrayed by Perrey Reeves. Later, in the episode "Secrets", it is revealed that she left him the night before their wedding, and states that she wasn't ready to find a real love, but she was ready to be married. Because she felt that Tony would only accept a real love from her, she broke off the engagement, but soon after married a stockbroker who, in her own words, "loved money more than people". She divorced the stockbroker after having his child, who lives with her. She claims to have invited Tony for Christmas brunch because now she was ready for love, though Tony declines her offer to renew their relationship. Tony's former partner while working in uniform at Philadelphia PD, portrayed by Marisol Nichols. Keats appears in season 12 episode "Parental Guidance Suggested", later in episodes "The Enemy Within & No Good Deed". Keats is an ATF Special Agent and becomes Tony's girlfriend. Tony's relationship with Kate could be depicted as a sibling relationship, but could also be depicted romantic too and series creator Don Bellisario said that if Kate hadn't died, she and Tony would have embarked on a relationship throughout one point of the series. They constantly compete, and Kate is often critical of Tony's behavior, especially concerning his attitude towards women and his disrespect for personal boundaries; indeed, Tony routinely goes through her purse, cellphone, PDA and desktop computer, uncovering personal informations such as her dates' identities. In one episode, Tony sneaks unbeknownst to Kate into the bathroom while she was having a shower in order to brush his teeth, which infuriates her when she noticed him and she strikes back by throwing a wet sponge at him. In "Bikini Wax", he found a photo of Kate during a wet t-shirt contest from his college days and threatens to show it to the rest of the team whenever she teases him, although the plan backfires when she gets Abby, the team forensic scientist, to photoshop Tony's face on to an equally racy photo and both accidentally e-mail it to Gibbs while attempting to delete them. However, it is not uncommon for Tony to be teased and taunted by Kate; their bickering gets so bad in the episode "Pop Life" that they seek counseling from Ducky. However, on many occasions he is shown being considerate and kind to Kate. He buys her flowers as a peace offering after annoying her in the episode "Vanished". He shows concern for her at the end of episodes "Left For Dead", when she realizes she had been played by a victim, and "Bête Noire", when she is held hostage by Ari. In the episode "The Bone Yard", Tony pretends to be Kate's lover to get into a paternity clinic to photograph evidence for Abby; later in the same episode, he tells Kate he thought they made a good couple, to which she replies "Maybe for the Jerry Springer Show". In the episode "Black Water", he appears close to jealousy when Kate accepted a date offered by the victim's brother. During the events of "My Other Left Foot", Tony is obsessed by the idea of Kate having a tattoo and asks to know its location during the whole episode. In extras seen on the Season 2 DVD Box Set, the producers state that it was intended for there to be a relationship between these two characters. In the episode "SWAK", after Kate is found uninfected, she continues to stay with Tony, lying about her condition to him even though she knows that the risk of infection is still imminent. As he was about to die, she is devastated and starts crying, but Tony eventually survives, much to her relief. Standing with Gibbs and Kate when the latter is killed, he is shocked. Her death would have a serious impact on him, which along with other events make Tony "grow up" during the following seasons. As shown in the episodes "Kill Ari 1 & 2", the team struggles to deal with the shooting, culminating in a scene in which Tony and McGee mourn over the dead body of their deceased colleague in Ducky's autopsy room. After Kate's death, like the other characters, DiNozzo also has a vision of her postmortem. Typical to Tony's chauvinistic personality, Kate appears in the Catholic schoolgirl uniform that he had been asking about in the episode "Bikini Wax". After telling him that she always knew what he was thinking, she realizes that she is wearing the uniform and quickly berates him, saying, "Tony, I just died, and you're having a sexual fantasy?" to which he replies, "Can't help it. Sometimes I used to picture you naked" and she responds by screaming in shock seconds before Ziva David is introduced for the first time. This "sexual fantasy" is portrayed after Tony offers to go back out in the pouring rain to find the bullet that killed Kate and becomes upset when McGee improves the answer he had told to Gibbs. When Gibbs was shot and experienced various coma fantasies of what his life would have been like if key events had turned out differently in the episode "Life Before His Eyes", his first vision explored a world where Kate was never killed, with her and Tony married with a baby girl. In the Season 10 episode, "You Better Watch Out", Tony is shown to have a goldfish named Kate, whom he teases like his former partner (telling the fish she's "getting fat"), despite clearly doting on it. EJ is introduced in the season 8 episode "One Last Score" as the lead investigator of the task force consisting of two other agents (Cade and Levin) that Director Vance creates to catch the Port-to-Port killer, later revealed to be Lt. Jonas Cobb. It is revealed that she took Tony's position in Rota, Spain after Tony declined Director Shepard's offer to grant him his own team. Tony and EJ begin a sexual relationship shortly after her arrival, much to the disapproval of Gibbs, who believes that coworkers should never be involved romantically. They end their affair with the conclusion of the season. In the season 9 premier Nature of the Beast, it is shown through a series of flashbacks that Tony, while working on a covert operation given to him by SecNav, had confronted EJ about her removal of a microchip from Levin's body after he was killed by Cobb. Tony, EJ and Cade are all lured to an alley, resulting a violent shooting in which Cade is fatally shot, Tony suffers a concussion and temporary memory loss, and EJ disappears. Later, in the episode Housekeeping, EJ comes out of hiding after witnessing the murder of a friend from whom she had been seeking help. She and Tony go to a safehouse, where they briefly discuss the events of the previous months. After the shooter, who was also responsible for Cade's murder, is apprehended, EJ and Tony permanently go their separate ways. In the fourth season, Tony's relationship with Jenny Shepard is shown to have warmed considerably in comparison to the end of the third season, with Tony occasionally being caught referring to her by her first name with even Gibbs joking about how close they were. The main reason for the warming of their relationship is the fact that Tony was involved in an ongoing operation run by Shepard, which is of personal importance to her. As they are keeping secrets, they develop a strong level of trust. On Gibbs' absence, Tony takes on his job and its associated responsibilities; this means his interactions with the director become more frequent and as a consequence his relationship with her became more familiar, as seen in the episode "Shalom". Tony was particularly upset at Director Shepard's death in the episode "Judgment Day (Part 1)". He considers the event to be his fault because he had followed the director's instruction to abandon her protection detail. In the episode "Agent Afloat", Ziva reveals that, in the aftermath of Jenny's death, Tony had been drinking out of guilt. Tony greatly respects Gibbs and claims to have a mentor/protégé or father/son type relationship with him, a feeling supported by the "tough love" Gibbs often demonstrates. In the episode "Sandblast", when trying to talk to a mentally disabled man who unknowingly has a bomb in his backpack, he mentions, "my son Tony plays the same game". Tony is easily riled when it seems that Gibbs has a new favorite, and tries desperately to win back favor. Gibbs has the tendency to smack Tony on the back of the head whenever he says or does something inappropriate, starting with the last flashback sequence of "Baltimore", however Gibbs tells Tony that he was "irreplaceable" in the episode "Missing". Tony tolerates being smacked only by Gibbs; when Todd gives him a similar smack in the episode "Reveille" he reacts with momentary anger and the same reaction is shown when Ziva mirrors Gibbs' smack in the episode "Probie". Tony prides himself on knowing many of the military terms, acronyms and slang that Gibbs regularly uses and which sometimes confuses civilians. Phrases such as these uttered by Tony include "On your six" or "got your six". This refers to the six o'clock position being at the back as 12 o'clock is at the front, as in ground or flying formations (explained in CBS's NCIS Glossary of terms). Throughout the first seasons of the series, Tony made it a point to explain several agency acronyms to Todd and occasionally to McGee (thus having them become an audience surrogate). Similarly, he also explains Gibbs' unorthodox interrogation techniques to new agents and observers in the observation room and can often accurately predict his next moves. In the episode "Kill Ari (Part 1)", Gibbs starts "being nice" for about half the episode. The change in his demeanor bothers Tony, and he tells McGee: "He's not Gibbs if he's nice." Tony then makes up his mind to tick Gibbs off so that he will return to his old behavior, and he finally succeeds with an inappropriate remark toward Director Shepard that leads Gibbs to give him his usual slap to the back of the head. Pleased with himself, Tony then welcomes Gibbs back. After Gibbs leaves at the end of season 3, he personally appoints Tony as team leader. As leader, he tries to emulate Gibbs' leadership style, but he did make some changes. These included calling "Campfire" discussions (an impromptu sharing of current information among his fellow agents, which his peers found annoying), and reorganizing the equipment in the field truck. When Tony is offered his own team in Rota, Spain, he turns the offer down claiming that he wanted to keep an eye on Gibbs, whose memory has still not completely returned after the blast at the end of season 3. Gibbs indicates his belief that Tony is ready for his own team, unaware of the fact that Tony has already been offered this opportunity. During the time that Gibbs was away, Tony begins working on an undercover operation with Director Shepard. Gibbs, unaware of the operation and noticing an unusual closeness between Tony and the director, questions the relationship. In the episode "Blowback", the undercover operation is finally revealed to Gibbs and Tony apologizes for not disclosing any information about it. In "Flesh and Blood", Gibbs confronts Tony's father about his lifelong neglect of his son. In the same conversation, Gibbs tells Tony's father that Tony is the best young Agent with whom he has ever worked. DiNozzo Sr. tells Gibbs off, believing him to have crossed a line, but adds that Tony thinks the world of Gibbs. Although he thinks very little of DiNozzo senior, Gibbs does encourage DiNozzo and Senior to repair their relationship. As of season 10, Gibbs and Senior appear to be on friendly terms. Through flashbacks in the episode "Baltimore", it is shown that Tony first met Gibbs sometime in 2001 when he accidentally arrested the latter, who was working undercover and investigating the same suspect in a separate case, as a homicide detective with Baltimore PD. Tony became disillusioned when he realized that his partner was dirty but could not bring himself to expose him. Gibbs took the opportunity to recruit him to NCIS and has been a mentor to him since. Throughout the first several seasons, Tony's co-workers have all remarked that he is becoming more and more like Gibbs, especially when the latter is not around, much to Tony's annoyance. They also know each other well enough to predict the other's next move and read each other's behavioral cues with a single look. Emotionally scarred when his doomed relationship with Jeanne Benoit ended, he begins confiding in Gibbs on personal issues, especially after DiNozzo Senior is introduced in Season 7 and the frosty love-hate relationship between father and son is revealed. Tony's relationship with Timothy McGee was initially problematic. Initially, before McGee officially joined the team, McGee was extremely respectful and looked up to Tony, often calling him "sir" and asking his permission to do things, while Tony largely ignored or degraded his work. After joining the team, Tony began actively hazing McGee, as McGee is the least experienced member of the NCIS team and ranks only as a junior field agent having only worked at NCIS for five or six years. For example, when McGee joined the team as a probationary Special Agent, Tony began calling him "Probie" (including variations such as "Probie-Wan Kenobi"). He largely takes advantage of McGee's naiveté and unfamiliarity with the team's "customs", such as tricking him into drinking Gibbs' coffee as shown in the Season 2 episode "Forced Entry" and assigning him unwanted and "dirty" tasks such as tracking down a gun in a mud pool and digging for evidence. Like Mike Franks did with Gibbs when Gibbs was a probie, Tony also frequently made McGee carry all the gear and equipment to the crime scene. In "Red Cell", he and Kate pick the lock to McGee's apartment early in the morning several hours before they were due to report for work to "observe you in your natural environment", having bet on whether McGee wore boxers or "tighty whities". Some of Tony's other nicknames for McGee are plays on his name, ranging from "McGeek" to "McGoogle" to "McProbie. He also refers to McGee's online-gaming persona Elf-Lord. In some cases the names refer to aspects of McGee's character, such as "McTardy", a reference to McGee being late, "McSneaky", as a reference to his ability to get almost any computer-related document, and "McCheat", a reference to McGee supposedly cheating at Scrabble. DiNozzo (at least once) has also asked McGee, "What are you Mcdoing, McGee?" Often, he (DiNozzo) and Caitlin Todd (and later Ziva David) are shown teaming up to tease McGee, although it remains friendly. Contrary to appearances, Tony values his relationship with McGee, as seen in the episode "Probie"; Tony goes out of his way to support McGee and makes an effort to cheer him up. Particularly shown when McGee accidentally shoots an undercover police officer, Tony is the first one to try to allay McGee's feelings of guilt. At one point, after McGee has expressed his chagrin at being called "Probie", Gibbs tells him that Mike Franks still calls him "Probie" and suggests that it is not a sign of distaste or disrespect. During Gibbs' absence, however, McGee becomes the senior field agent as Tony is now team leader. At this time, Tony shows much more respect for McGee and confidence in his abilities. He also covers for McGee several times when the entire team was late to a crime scene – thus incurring Gibbs' wrath – because of him. In the beginning of the seventh season, Tony has more frequently called McGee by his first name, Tim, instead of these nicknames. An example of this is when McGee is explaining something to Gibbs and Tony says, "It's a burn phone, Tim, just say burn phone." It has been shown a few other times as well. The relationship between the two agents is on a much more equal footing as the show moves into the seventh season. McGee is very rarely (if at all) referred to as "Probie" any more by Tony, especially since Ziva has become a probationary field agent. After Ziva's departure from the team in the eleventh season, Tony has become a lot closer to McGee and they have started to confide in one another much more than they used to. For instance, McGee is the one Tony tells that he has been attending a support group to get over the events of Ziva's departure. McGee also goes to Tony for advice when he is considering asking his girlfriend move in with him; in the same case, when Delilah confides in Tony that she has been offered a job in Dubai, he goes to tell McGee about her plans. DiNozzo was included in TV Guide's list of "TV's Sexiest Crime Fighters". In November 2011, DiNozzo won TVLine's "Ultimate Male Law-Enforcement Crushes Bracket Tournament", and Ziva David won the "Ultimate Female Law-Enforcement Crushes Bracket Tournament" a month later. His flirtation with Ziva received significant media coverage over the years, with the characters being referred to as a "power couple" by Entertainment Weekly. In 2009, TV Guide dubbed their interactions "TV's hottest love-hate relationship" and in 2012, they were listed in Entertainment Weekly's "30 Best 'Will They/Won't They?' TV Couples". EW.com also included them in its compile of 10 "TV pairs who have us hooked as they dance around their attraction". During the first season of NCIS in 2004, Ross Warneke of The Age described the character as "fearless but a bit wet behind the ears". A year later, Bill Keveny from USA Today commented that DiNozzo was "competent but immature". At the beginning of the third season, Noel Holston from Sun Sentinel described him as "a self-styled ladies' man, handsome yet hapless". In 2011, one critic from Slate called him a "womanizing doofus given to spouting movie trivia" but added that all of the characters on the MCRT team (Tony, Gibbs, Ziva, and McGee) "are men and women of honor, heroes who have all made significant sacrifices for their country". In 2012, Sandra Gonzalez from Entertainment Weekly wrote, "I have a deep appreciation for everything about Tony DiNozzo. I love his goofball ways, his pop culture references, and his endless supply of ways to get under McGee's skin. But like any perpetually lovable character on a TV drama, he also has a host of dark secrets, and when said secrets have a chance to come to the surface as part of a meaty and revealing storyline, it's a treat for us all." He was referred to as a "charming goofball/special agent" by AOL TV's Michael Maloney in 2010. Catherine Lawson from The Huffington Post reported in August 2011 that Michael Weatherly was voted as number seven in the list of the top 10 most popular primetime TV stars. Pauley Perrette (Abby Sciuto) and Cote de Pablo (Ziva David) placed first and second respectively. Additionally, Mark Harmon (Jethro Gibbs) and David McCallum (Ducky Mallard) were voted as numbers five and six. ^ a b c d "South by Southwest". NCIS. Season 6. Episode 17. February 24, 2009. CBS. ^ Season 3, Episode 15 "Head Case"
^ Season 3, Episode 9 "Frame Up"
^ "CBS Bio of Michael Weatherly". Cbs.com. August 6, 2008. Archived from the original on March 6, 2009. Retrieved May 2, 2009. ^ a b c NCIS Angel of Death 4x24 => Audio Commentary by Donald P. Bellisario (NCIS: The Fourth Season (DVD)). CBS Home Entertainment. 2007. ^ a b c d "Michael Weatherly on His 'NCIS' TV Dad, Robert Wagner". AOL TV. January 12, 2010. Retrieved February 17, 2013. ^ a b "'NCIS' Star Pauley Perrette Named Most Popular Primetime TV Star". HuffPost. Retrieved February 17, 2013. ^ Egner, Jeremy (2016-01-06). "Michael Weatherly Leaving 'NCIS'". The New York Times. ISSN 0362-4331. Retrieved 2016-04-08. ^ "Family First". NCIS. Season 13. Episode 24. May 17, 2016. Event occurs at 09:41. CBS. DiNozzo: "What do we know? What are the facts? 'Cause we don't assume, we verify. Do we know she's dead? 'Cause if we know she's dead, we're gonna get him." Gibbs: "Yeah, she's dead, and we will get Kort." ^ NCIS Kill Ari 3x01 => Audio Commentary by Donald P. Bellisario (NCIS: The Third Season (DVD)). CBS Home Entertainment. 2005. ^ Ford Sullivan, Brian (February 27, 2007). "Interview: 'Ncis' Star Michael Weatherly". The Futon Critic. Retrieved June 9, 2013. ^ "Video Interview: NCIS's Gary Glasberg & Michael Weatherly". World Screen. March 5, 2013. Retrieved March 5, 2013. ^ "Exclusive: NCIS Cast Gathers for Roundtable Tell-All!". TV Guide. November 6, 2012. Retrieved March 5, 2013. ^ Willman, Chris. "First Look: NCIS' Michael Weatherly Gets His Shot". TV Guide. Retrieved March 6, 2013. ^ Williams, Scott (March 20, 2013). "INSIDER'S BLOG: "SEEK"". CBS. Archived from the original on April 1, 2013. Retrieved April 4, 2013. ^ "Kill Ari (Part I)". NCIS. Season 3. Episode 1. September 20, 2005. CBS. ^ "Designated Target". NCIS. Season 5. Episode 8. November 13, 2007. CBS. ^ a b "Twisted Sister". NCIS. Season 4. Episode 9. November 21, 2006. CBS. ^ "NCIS Fun Facts". BuddyTV. Retrieved February 12, 2013. ^ "NCIS "Flesh and Blood" Quotes". TV Fanatic. Retrieved February 16, 2013. ^ "Nature of the Beast". NCIS. Season 9. Episode 1. September 20, 2011. CBS. ^ "Bete Noire". TV.com. Retrieved February 17, 2013. ^ "Untouchable". TV.com. Retrieved February 17, 2013. ^ "Keck's Exclusives: NCIS Reveals Tony's Movie Magic". TV Guide. Retrieved February 17, 2013. ^ "Silver War". NCIS. Season 3. Episode 4. October 11, 2005. CBS. ^ a b "'NCIS' Episode 10.10 Preview: Will Tony's Dad Bring His Son Angst for Christmas?". BuddyTV.com. December 18, 2012. Retrieved February 11, 2013. ^ "NCIS Review: "Flesh and Blood"". TV Fanatic. January 13, 2010. Retrieved February 11, 2013. ^ "The Good Samaritan". NCIS. Season 1. Episode 14. February 17, 2004. CBS. ^ "Head Case". NCIS. Season 3. Episode 15. February 7, 2006. CBS. ^ "Conspiracy Theory". NCIS. Season 2. Episode 19. April 12, 2005. CBS. ^ a b c d "Employee Assessment File: "Tony" DiNozzo". CBS.com. Archived from the original on February 18, 2008. Retrieved October 1, 2009. ^ "Dead Man Talking". NCIS. Season 1. Episode 19. April 27, 2004. CBS. ^ "Frame Up". NCIS. Season 3. Episode 9. November 22, 2005. CBS. DiNozzo remarks that a particular incident occurred during 2002 when he was at the Baltimore Police Department. ^ Season 1, Episode 2 "Hung Out to Dry"
^ Marsi, Steve. "NCIS Review: Baltimore's Finest". TV Fanatic. Retrieved February 11, 2013. ^ a b Marsi, Steve (September 21, 2011). "NCIS Season Premiere Review: His Navy, My Team". TV Fanatic. Retrieved February 11, 2013. ^ "Engaged (Part II)". NCIS. Season 9. Episode 9. November 15, 2011. CBS. ^ "Flesh and Blood". NCIS. Season 7. Episode 12. January 12, 2010. CBS. ^ "Ice Queen". JAG. Season 8. Episode 20. April 22, 2003. CBS. ^ a b c ""NCIS": Will the Real Tony DiNozzo Please Stand Up". Yahoo!. November 12, 2010. Retrieved February 16, 2013. ^ a b c d "NCIS Character Analysis – Agent Tony DiNozzo". Yahoo!. November 13, 2009. Archived from the original on February 28, 2014. Retrieved February 16, 2013. ^ "NCIS' Michael Weatherly on Tony DiNozzo: He's Annoying and Irritating". TV Fanatic. Retrieved February 17, 2013. ^ "Split Decision". NCIS. Season 1. Episode 21. May 11, 2004. CBS. ^ a b c Marsi, Steve (November 2, 2009). "NCIS' Michael Weatherly on Tony DiNozzo: He's Annoying and Irritating". TV Fanatic. Retrieved February 11, 2013. ^ a b "Bait". NCIS. Season 3. Episode 18. May 14, 2006. CBS. ^ "Donald Paul Bellisario, Creator of NCIS". Yahoo!. Archived from the original on February 28, 2014. Retrieved February 18, 2013. ^ a b "Red Cell". NCIS. Season 2. Episode 20. April 26, 2005. CBS. ^ "Heart Break". NCIS. October 30, 2004. CBS. ^ a b c "Caught on Tape". NCIS. Season 2. Episode 15. February 22, 2005. CBS. ^ "Collateral Damage". NCIS. Season 6. Episode 7. CBS. ^ "Meltdown". JAG. April 29, 2003. CBS. ^ a b "Capitol Offense". NCIS. Season 6. Episode 3. October 7, 2008. CBS. ^ "Bulletproof". NCIS. Season 11. Episode 15. February 25, 2014. ^ "Left for Dead". NCIS. Season 1. Episode 10. January 6, 2004. 15:55 minutes in. ^ "Probie". NCIS. November 29, 2005. CBS. ^ "Agent Afloat". NCIS. September 30, 2008. CBS. ^ Season 3, Episode 17 "Ravenous"
^ Season 1, Episode 23 "Reveille"
^ Bryant, Adam. "NCIS: What Does DiNozzo's Ex Mean for Tony and Ziva?". TV Guide. Retrieved February 11, 2013. ^ Season 4, Episode 18 "Iceman"
^ Season 4, Episode 14 "Friends and Lovers"
^ Season 6, Episode 18 "Knockout"
^ Marsi, Steve. "NCIS Review: The Secret Life of Tony DiNozzo". TV Fanatic. Retrieved February 11, 2013. ^ a b c "NCIS Character Analysis – Agent Kate Todd". Yahoo!. November 13, 2009. Archived from the original on February 28, 2014. Retrieved February 16, 2013. ^ Season 1, Episode 19 "Dead Man Talking"
^ Season 2, Episode 6 "Terminal Leave"
^ Season 2, Episode 22 "SWAK"
^ "Kill Ari (Part 1)". NCIS. Season 3. Episode 1. September 27, 2005. 23:30 minutes in. ^ Mitovich, Matt Webb. "Michael Weatherly Talks About Directing NCIS and How a New Woman Will Revive Tony's Spirit". TV Line. Retrieved February 16, 2013. ^ Marsi, Steve Webb. "NCIS Review: The Eyeball, Rule #12 and the Rhinoceros in the Room". TV Fanatic. Retrieved February 16, 2013. ^ Marsi, Steve (January 3, 2012). "NCIS Review: Never Bring a Knife to a Gun Fight". TV Fanatic. Retrieved February 16, 2013. ^ Season 6, Episode 6 "Murder 2.0"
^ "Flesh and Blood". TV.com. Retrieved February 17, 2013. ^ "Hometown Hero". NCIS. Season 2. Episode 21. May 3, 2005. CBS. ^ "Bounce". NCIS. Season 6. Episode 16. February 17, 2009. CBS. ^ "Rekindled". NCIS. Season 9. Episode 21. April 21, 2012. CBS. ^ "Flesh and Blood". NCIS. Season 7. Episode 10. January 12, 2010. CBS. ^ "Sins of the Father". NCIS. Season 9. Episode 10. November 22, 2011. CBS. ^ "The Bone Yard". NCIS. Season 2. Episode 5. October 26, 2004. CBS. ^ a b "South by Southwest". NCIS. Season 6. Episode 17. 2009-02-24. CBS. ^ "NCIS' Tony DiNozzo Wins Our Ultimate Law-Enforcement Crushes Bracket Tournament". TVLine. Retrieved February 16, 2013. ^ "NCIS' Ziva David Wins Our Ultimate Female Law-Enforcement Crushes Bracket Tournament". TVLine. Retrieved February 16, 2013. ^ Rice, Lynette (April 9, 2013). "'NCIS': See Tiva get up-close and personal – EXCLUSIVE PHOTO". Entertainment Weekly. Archived from the original on April 11, 2013. Retrieved May 16, 2013. ^ Bierly, Mandi; Fog, Henning (May 13, 2012). "30 Best 'Will They/Won't They?' TV Couples | Photo 11 of 30". Entertainment Weekly. Time Inc. Retrieved October 8, 2012. ^ Stroup, Kate (January 25, 2010). "10 'Will They/Won't They?' TV Couples; Photo 7 of 11". Entertainment Weekly. Time Inc. Retrieved May 21, 2013. ^ Warneke, Ross (May 13, 2004). "Death of Sunday movies". The Age. Melbourne. Retrieved February 23, 2013. ^ Keveney, Bill (January 11, 2005). "'NCIS': CBS' invisible success". USA Today. Retrieved March 5, 2013. ^ Holston, Noel (November 29, 2005). "Cowboy Mentality Helps Ncis Grow In Numbers". Sun Sentinel. Retrieved June 7, 2013. ^ Thomas, June (November 9, 2011). "NCIS, WTF?". Slate. Retrieved February 16, 2013. ^ Gonzalez, Sandra (April 18, 2012). "'NCIS' react: Tony reunites with the 'kid from Baltimore'...and it's heartbreaking". Entertainment Weekly. Retrieved February 17, 2013. "Kill Ari (Parts I & II)"
"Hiatus (Parts I & II)"
"A Man Walks Into a Bar..."